People pay a lot of attention to presentation: across whatever endeavours people wish to compete in in the marketplace, it will most often be in the realms of presentation that products differ. Do you want your breakfast cereal of treated corn to make you feel less ugly than you usually do, or do you want it to give you the power to lead in the office? In either case, there’s packaging of a very similar product to meet the way in which one wants to perceive themselves. Blizzard have for an incredibly long time understood this: in spite of any potential shortcomings of their products, particularly in recent iterations of long-running franchises, the packaging has always been beautiful. Be it StarCraft, Warcraft or Diablo, the games have consistently, in spite of variations in gameplay or aesthetic, provided interfaces and marketing products that have sold the games as “best in class”, even where this is disputed to be the case. Hearthstone is no exception to this. 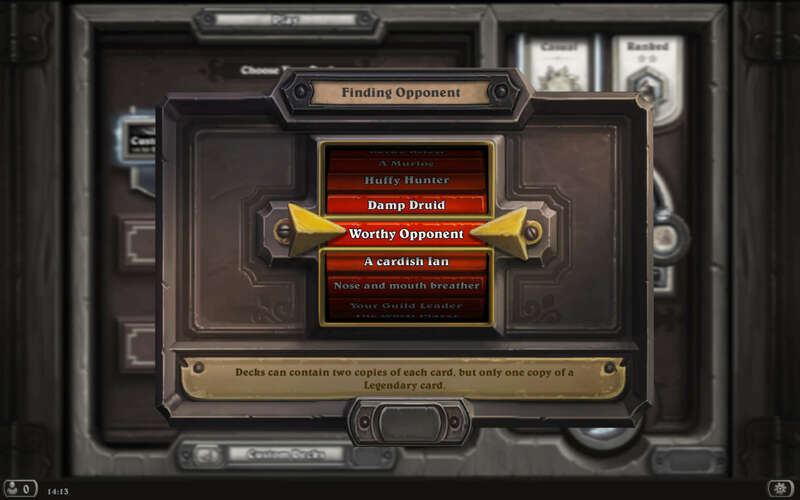 It is very nice packaging that Hearthstone has: interface elements share a consistent visual language, and even within the context of a computerised collectible card game, elements of the game intended to convey action provide a degree of visual and auditory feedback that seems to exceed preconceived notions of how far tension concerning tokenised entities such as summoned creatures can be developed. The sounds of your own creatures attacking and being attacked; your own spells being cast and your enemy casting spells: these are things that quickly come to represent both good and bad events, both fear and elation when combined with the visual cues that accompany these in-game events. This wonderful piece of user experience engineering, however, is vastly overshadowed by an incredibly shallow game that carelessly walks the tightrope above a designation of being “Skinner box-like”, in danger of the presentation not being enough to cover up its base mechanics at all times. Particularly on mobile platforms, it has become incredibly difficult not to be sceptical of the designation of something as being “free-to-play.” Liberal interpretations of the descriptor “free” and of the verb “play” have led to a reasoned cynicism within the mobile context, particularly given the key platform holders of Google and Apple provide platform integration for in-app purchases that make use of existing payment methods against account: paying for the privilege of being able to perform more actions within a game is incredibly simple and normalise the idea that play isn’t enough, something else is required for success. Hearthstone, on the face of it, is not that cynical, but the mechanics of the free-to-play model are engineered to support other gameplay decisions that incentivise a “grinding” type of playstyle. Chief among these is the breaking up of cards into groups that can only be used by given classes of “player character”, where there are nine classes. It is entirely possible, then, that if a player were to buy a random booster pack of cards within the game, that they would not receive a single card that they would be able to make use of while playing in a manner that is in accordance with their preferred playstyle. While these booster packs can be earned through the exchange of in-game currently earned through completion of designated quests within the game, the randomness of receiving (or not) anything that will be usable by the player with a “real money” transaction seems somewhat unethical. 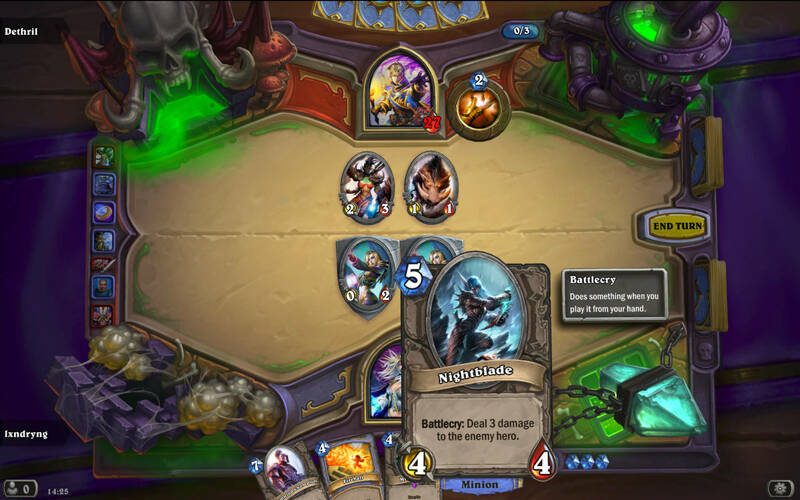 Gameplay in service of a model of monetisation is unlikely to only fail in regard to how that monetisation works, and the strategic elements of a CCG such as Hearthstone are what suffers. There are clear dominant strategies within the game centred around low cost cards and cards that allow the player to draw more cards: just as how in Starcraft the Zerg rush was a dominant strategy for a while, overrunning ones opponents in Heartstone with lots of small, yet hard to deal with, creatures appears to be a way to fundamentally break the game. Once a player realises this, and given that victory is rewarded with the potential for more in-game currency rewards, there is very little thought involved in the game and it becomes a repetitive exercise in playing as many creatures as one can in a turn and waiting for the inevitable empty victory. Cynical design is a horrid thing, particularly where its aim to extract money from people with guarantee of an individual’s transaction giving them anything that they can use. Though the randomness element of the purchases of booster packs could be explained away with an individualistic “caveat emptor”, there seems to be a perverse lack of care in the balance of the game that may reward further purchases of boosters, with “rarer” cards generally being more powerful than more common cards. Of course, this is an exercise in balance in and of itself, but scarcity is a lazy proxy for true balance between cards. Scarcity as a means of “status” within the game’s community and a more balanced and varied suite of cards and abilities may overcome the mechanical shortfalls of Heartstone, but the monetisation approach is rotten to its core.